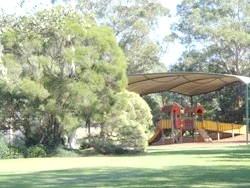 Central Gardens Nature Reserve is a large family friendly park offering a combination of picnic areas, playgrounds, bushland, bird and animal enclosures, and playing fields. It is located in Merrylands, bordered by Merrylands Road, the Cumberland Highway and Paton Street. 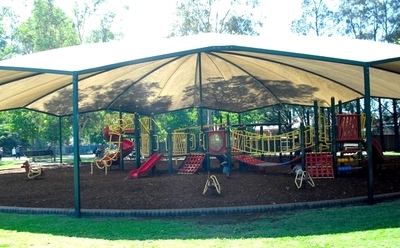 My children love visiting the animals in the enclosures at the bottom area of the reserve before running off to climb and slide at one of the two playgrounds, which are both covered providing a lovely large shaded area for children to play out of the sun. A walking track circles the park for those looking for some exercise in the fresh air. 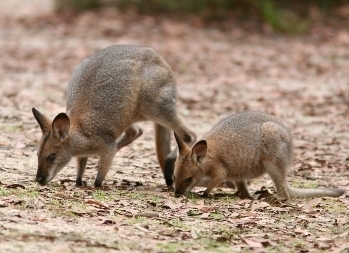 Some of the animals we have seen during our visits include kangaroos and wallabies, emus, wombats, and native birds including a talking cockatoo. There is also a huge man made lake that is home to lots of ducks and other birdlife as well. The bushland areas would be lovely for wedding photos or for a garden ceremony. Toilet facilites (including those suitable for the disabled) are located close to the Merrylands Road and Paton Street entrance. Entry is free. Hours of operation are 7.30am to 5pm Monday to Friday and 9am to 5pm on weekends. Daylight savings sees the opening hours extended to 7.30am to 7pm weekdays and 8am to 7pm on weekends. The park is closed on Good Friday and Christmas Day. Free car parking is located off Merrylands Road and Paton Street. On street parking is also available in Paton Street.